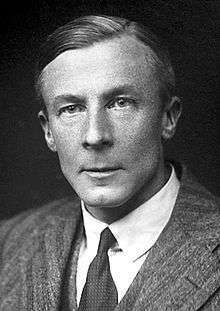 Edgar Douglas Adrian, 1st Baron Adrian OM PRS (30 November 1889 – 4 August 1977) was an English electrophysiologist and recipient of the 1932 Nobel Prize for Physiology, won jointly with Sir Charles Sherrington for work on the function of neurons. He provided experimental evidence for the all-or-none law of nerves. Adrian was born at Hampstead, London, to Alfred Douglas Adrian, legal adviser to the Local Government Board, and Flora Lavinia Barton. He attended Westminster School and studied Natural Sciences at Trinity College, Cambridge, graduating in 1911 and in 1913, he was elected to a Fellowship of Trinity College on account of his research into the "all or none" law of nerves. After completing a medical degree in 1915, he did clinical work at St Bartholomew's Hospital London during World War I, treating soldiers with nerve damage and nervous disorders such as shell shock. Adrian returned to Cambridge as a lecturer and in 1925 began research on the human sensory organs by electrical methods. Jennet Adrian (b. 1927), who married Peter Watson Campbell. "I had arranged electrodes on the optic nerve of a toad in connection with some experiments on the retina. The room was nearly dark and I was puzzled to hear repeated noises in the loudspeaker attached to the amplifier, noises indicating that a great deal of impulse activity was going on. It was not until I compared the noises with my own movements around the room that I realised I was in the field of vision of the toad's eye and that it was signalling what I was doing." A key result, published in 1928, stated that the excitation of the skin under constant stimulus is initially strong but gradually decreases over time, whereas the sensory impulses passing along the nerves from the point of contact are constant in strength, yet are reduced in frequency over time, and the sensation in the brain diminishes as a result. Extending these results to the study of pain causes by the stimulus of the nervous system, he made discoveries about the reception of such signals in the brain and spatial distribution of the sensory areas of the cerebral cortex in different animals. These conclusions lead to the idea of a sensory map, called the homunculus, in the somatosensory system. Later, Adrian used the electroencephalogram to study the electrical activity of the brain in humans. His work on the abnormalities of the Berger rhythm paved the way for subsequent investigation in epilepsy and other cerebral pathologies. He spent the last portion of his research career investigating olfaction. Positions that he held during his career included Foulerton Professor 1929–1937; Professor of Physiology in the University of Cambridge 1937–1951; President of the Royal Society 1950–1955; Master of Trinity College, Cambridge, 1951–1965; president of the Royal Society of Medicine 1960–1962; Chancellor of the University of Cambridge 1967–1975; Chancellor of the University of Leicester 1957–1971. Adrian was elected a Foreign Honorary Member of the American Academy of Arts and Sciences in 1938. In 1946 he became foreign member of the Royal Netherlands Academy of Arts and Sciences. In 1942 he was awarded membership to the Order of Merit and in 1955 was created Baron Adrian, of Cambridge in the County of Cambridge. 1 2 Hodgkin, Alan (1979). "Edgar Douglas Adrian, Baron Adrian of Cambridge. 30 November 1889 – 4 August 1977". Biographical Memoirs of Fellows of the Royal Society. 25: 1–73. doi:10.1098/rsbm.1979.0002. PMID 11615790. ↑ Raymond J. Corsini (2002). The Dictionary of Psychology. Psychology Press. pp. 1119–. ISBN 978-1-58391-328-4. Retrieved 1 January 2013. ↑ Peter Townend, ed., Burke's Peerage and Baronetage, 105th edition (London, U.K.: Burke's Peerage Ltd, 1970), page 27. ↑ "Book of Members, 1780–2010: Chapter A" (PDF). American Academy of Arts and Sciences. Retrieved 6 April 2011. ↑ "Lord Edgar Douglas Adrian (1889–1977)". Royal Netherlands Academy of Arts and Sciences. Retrieved 2 August 2015. Karl Grandin, ed. (1932). "Edgar Adrian Biography". Les Prix Nobel. The Nobel Foundation. Retrieved 23 July 2008.